The multi-purpose DHC-6 Twin Otter aircraft has proven itself capable of handling any task for more than 50 years. Unity Aviation Canada provides Twin Otter services anywhere they are required. Rely on us to provide import and export of the Twin Otter for lease purposes across Canada and the United States or other points globally. We are the key service company for Unity Group Ltd's, Twin Otter lease fleet of aircraft, under our Transport Canada approved, maintenance organization (A.M.O. 60-02). 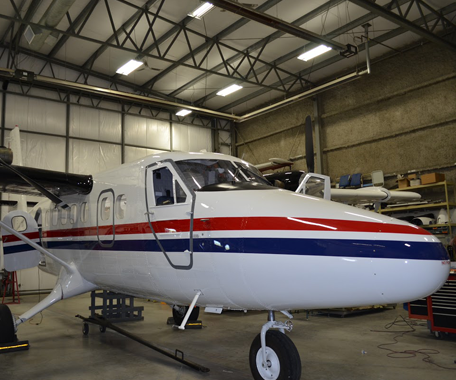 Our strong base of aircraft technicians will overhaul and repair the Twin Otter under the original manufacturers' specifications or approved alternate specs. Specialized offerings extend to service crews and assisting operators in foreign locations, while also performing damage assessments and evaluations for insurance purposes. We invite you to learn more about us and how we can be of assistance.